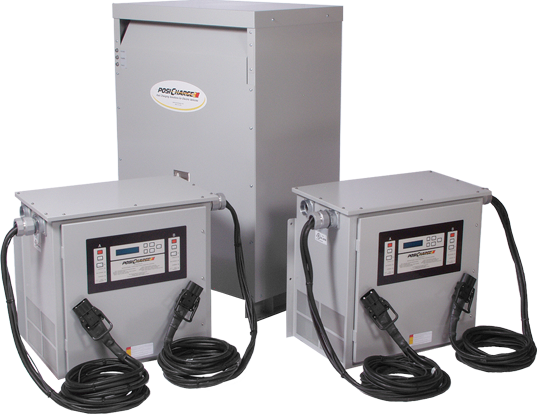 The PosiCharge™ MVS800 is our multiple-port, multi-vehicle fast charge system, especially designed to lower utility costs for distribution, warehousing, and general manufacturing. An MVS800 can charge up to 16 industrial vehicles (e.g. tow tugs, baggage tractors, belt loaders, etc.) at the same time. This cost saving alternative to conventional charging makes implementing and using electric GSE vehicles more cost effective. The more vehicles charged at once, the greater the cost benefit. Like the DVS, MVS features the highest power quality and most diverse multi-voltage, multi-amperage flexibility of any fast charging system available today. MVS systems are installed all across the world’s largest airports, as well as Fortune and Global 100 companies. And like all PosiCharge chargers, the MVS800 works with a broad range of battery voltages and has the same data management and onboard intelligence. 16 Simultaneous charging for up to 16 vehicles with our smart fast charging technology.